In 24 hours last week, Maryland higher education underwent a rapid shakeup. First came the long-expected but deeply regretted retirement announcement from William E. “Brit” Kirwan as top dog at the University System of Maryland. Then came the surprise announcement that former Baltimore Mayor Kurt L. Schmoke is returning to his hometown as president of the University of Baltimore. There’s no way to put a happy face on Kirwan’s retirement. He’s been Maryland’s Mr. Higher Education. 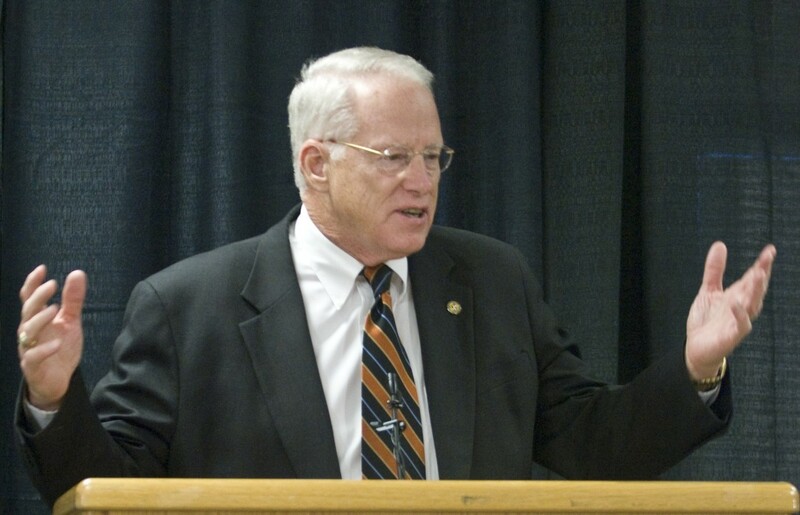 Except for five years running a little ol’ rustbelt university called Ohio State, Kirwan dedicated his 50-year academic career to UM. This former math professor staged a triumphal return from Ohio State as the popular choice to turn the UM system into a first-rate collegiate conglomerate. He largely succeeded. In some fields of study USM has an international reputation. Kurt Schmoke at Howard University. Schmoke, meanwhile, didn’t leave Baltimore in 1999 on an upbeat note. His three terms as mayor of a troubled, aging urban city received middling marks. Progress largely stalled. His place in the city’s history fades compared to his do-it-now predecessor (William Donald Schaefer) and his charismatic successor (Martin O’Malley). The quiet, thoughtful Schmoke was better suited to academia. He found his niche as dean of the law school at Howard University (2003-2012), where he restored the school’s diminished reputation. During a time of flux at Howard, he then provided stability in the dual roles of general counsel and interim provost. Now he’s been handed academia’s brass ring — a college presidency. Schmoke is fortunate he’s following the transformative Robert Bogomolny, who showed that a good manager with vision can put a struggling university on an upward trajectory. New, standout mid-town buildings. A full four-year undergraduate curriculum. A higher profile among Baltimore schools. Continuing that momentum should be easy for Schmoke, given his wide name recognition among city elites, his genial demeanor and his understanding of what makes Baltimore tick. The new UB president may have more difficulty adapting to the sharp elbows and intense in-fighting among leaders at the 11-campus, 154,000-student University System of Maryland. Schmoke fared well at Howard, a private college with 10,000 students. UB has only 6,500 students and is part of a huge public university closely scrutinized by Annapolis politicians and overseen by a chancellor. That’s where Kirwan could have provided strong support and guidance. He kept simmering intra-campus disputes under control and steered feuding parties toward collegial middle ground. He balanced competing interests at those institutions while demanding improved academic performance. Kirwan embarked on an efficiency and innovation campaign, under pressure from the Republican Ehrlich administration, leading to over $400 million in savings. This made tuition hold-downs possible under the Democratic O’Malley administration without harming classroom quality. The USM Chancellor championed broader use of less expensive internet courses, integrating computers into traditional lecture courses, eliminating non-essential offerings and revamping math, science and engineering programs. Kirwan knew how to communicate with powerful regents, governors, legislators, competing college presidents, students and the public. Finding a replacement with that same demeanor and collaborative mindset won’t be easy, but at least two USM presidents ought to receive strong consideration — Dr. Jay Perman at the University of Maryland, Baltimore, and Freeman Hrabowski at the University of Maryland Baltimore County. Without Kirwan around, Schmoke will have to learn through experience that being a second-tier college president in a massive university system like USM isn’t all upbeat. The system’s largest and most important campuses, UMB and the flagship College Park institution, get most of the money and attention — deservedly so. Meanwhile, a surging Towson University, with three times more students and massive campus improvements, is upstaging UB and attracting many of the best prospective UB undergraduates. At the same time, a federal lawsuit by historically black institutions over program duplication could put a crimp in UB’s plans to offer popular areas of study. Whither higher education in Maryland? Public higher education in Maryland is littered with question marks at the moment. It’s becoming too expensive. Yet demand grows for more and better career-path studies. Fund-raising is difficult because of the system’s heavy state subsidy. Competition among area institutions, both public and private (UMBC, Towson, UB, UMB, Coppin, Morgan State, Loyola, Notre Dame, Hopkins, Goucher, Stevenson), is intense. Schmoke will have his hands full at the University of Baltimore. So will Brit Kirwan’s successor as chancellor of the state’s university system.